Mezco reveals the newest addition to its ever-expanding Mortal Kombat X lineup: Raiden, Sub-Zero, and Scorpion Mortal Kombat X 3.75 Inch Figures. Each 3.75 inch scale figure features 23 points of articulation, many with ball joints, allowing them recreate all the moves and poses that have made them part of gaming legend. Scorpion, the hell-spawned specter. Ninjas need weapons and Scorpion has them. He comes complete with his spear tipped wrist chains, as well as 2 game accurate swords. He also has an additional pair of fighting hands. Raiden, the eternal God of Thunder. Even a God of Thunder needs weapons so he comes complete with game accurate alternate hands, alternate lightning hands, and a lightning ball. Sub-Zero, the icy assassin. Of course, Sub-Zero needs the weapons he is famous for, so he comes complete with his game accurate hammer and sword. Each Mortal Kombat X 3.75″ figure comes with a base with the Mortal Kombat logo on top as well as on the side. The ultimate battle begins in stores starting July-August 2016. You can pre-order the figures now. Sub-Zero, the icy assassin of Mortal Kombat legend, now presented as a 1:6 scale collectible figure. This 12 inch figure from the new Mortal Kombat X game has been created utilizing digital assets supplied by the game developers to ensure game-like accurateness. The Sub-Zero 12 inch figure based on the new Mortal Kombat X game, features nearly a dozen points of articulation, interchangeable hands as well as some of his most deadly weapons. He is packaged in a displayable window box. Sub-Zero and other Mortal Kombat X 12inch figures from Mezco begin the ultimate battle in stores starting November 2015! You can pre-order the figure now. 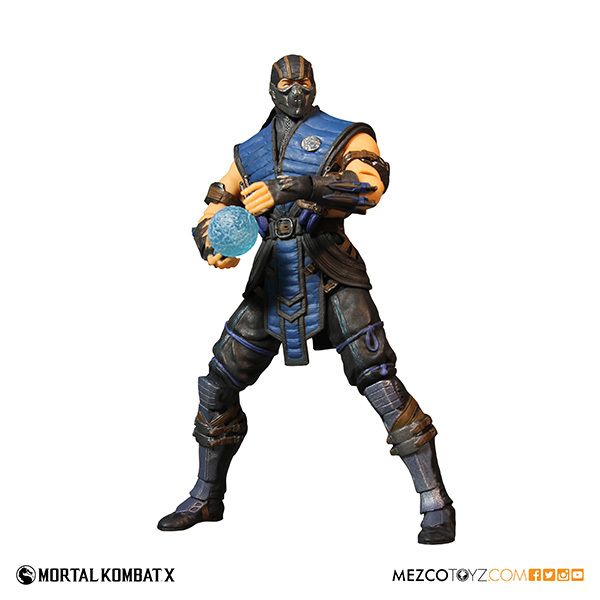 Mezco has unveiled one of the initial trio of Mortal Kombat X figures: Sub-Zero. This icy assassin is one of the most cold-blooded of all Mortal Kombat characters , and just like each of the three figures in Mezco’s initial wave , is one of the few to be a playable character in every version of the game. Mezco’s 6inch scale version features more than 17 points of articulation, many with ball joints, allowing him to recreate all the moves and poses that have made him part of gaming legend. Of course Sub-Zero needs the weapons he is famous for, so he comes complete with his game accurate ice hammer and ice sword. Sub-Zero comes in a collector friendly blister card perfect for display.